WordPress continues to be the most used content management system on the web due in no small part to its many plugins. So many, in fact, that typing the word event into the WordPress plugin directory pulls up over 1,000 options. Events themselves come in many different styles from in-person gatherings to online parties and webinars. It can take a mountain of research to find the right plugin for your event unless you have a handy cheat-sheet. Maybe you just want to list upcoming events on your site, or perhaps you need the ability to register guests and sell tickets online. Whatever your requirements, there is likely to be a WordPress events plugin out there already, its just a case of finding it. I’ve narrowed the 1000+ plugins list down by active installs, customer reviews, and product descriptions. Then I looked over all the best features of each to help you select the eight best WordPress plugins for events. Finding the one that suits your needs best should be much easier. So you want to create a website to promote your forthcoming event or add event promotion and management features to your existing WordPress website, one of these plugins should help you achieve your goals. There are also free, commercial, and freemium versions of some of these options available so do take that into consideration too when making a final decision. So without further ado, let’s dive in to eight of the best WordPress events plugins out there. Boasting four and a half stars with over 900 reviews in the WordPress Plugin Directory, The Events Calendar by Modern Tribe is clearly a user favorite. Several WordPress experts have put it through best practice and compatibility paces, and they’ve concluded that it’s absolutely stable and secure. That added compatibility means that it’s unlikely to cause trouble with other plugins or widgets you might have installed on your WordPress website. The Events Calendar plugin prides itself on being user-friendly, making it great for beginners or those of us who aren’t Web Developers. Modern Tribe even offers limited support on the free version – which is pretty unheard of in the world of free extensions and add-ons. The Events Calendar free version offers various calendar views and screen responsiveness, so the calendar looks great on any device, including smartphones and tablet. There are lots of options for categories, tags, and style sheets which will keep your events organized, easily searchable, and looking great. By using the views feature your visitors can filter and decide which content from your calendar is on display. This can help reduce clutter while also making it easier for them to find what they are looking for. Import and export features make maintaining your calendar simple. New events can be created quickly. The saved content feature allows you to recreate events that occur regularly with only a few clicks – a feature that will be appreciated by anyone with a busy schedule of events. The Pro version offers more calendar views, ticket sale options, publicly submitted events and social media integration with Facebook. Prices are $89 for personal use and $149 for business use. Developers can pay $299 for up to 10 sites. Overall, The Events Calendar plugin by Modern Tribe is a good all round option that is popular with users and lets you start out for free with the option of upgrading as your needs grow. Google Calendar users will love Google Calendar Events plugin. This is a free and simple plugin with smart functionality. It can actually analyze one or more Google Calendars to add events directly to the event calendar on your site. This could be a great time saver. It would also be ideal for sites that have multiple event planners using separate Google Calendars. A little light on features, Google Calendar Events does show lists and grids on posts, pages or a widget. It also has full customization on event information, but limited calendar view options. One nice feature is that you can maintain separate calendars on your site, but can see all the calendars events in a single feed. This is another great plugin for beginners or sites holding small events that don’t require ticket sales. If you and your team are already using the popular and free Google Calendar service then this option will be particularly appealing. Possibly the easiest event plugin of its type to use, Event List has a 4.7 out of 5 stars rating. That is the highest on our list, although it has a smaller number of active installs, at just 10,000. This is a very basic event plugin offering only a few options on event data. It also uses WordPress’ WYSIWYG editor which will be very familiar to WordPress newbies. The editor also allows you to stylize the text of the event, helping to make your calendar either stand out on the page or blend into the rest of your site. Events can be uploaded into Event List from .csv files, and a duplicate option allows you to copy an event to save time when creating new ones. Events can be categorized and those categories can also be synced with post categories, tying everything together nicely. It also lets filter events and include an event feed on your site. If you don’t need all the latest and greatest calendar features and just want a simple solution you can start using without too much trouble the free Event List is well worth checking out. Looking for the Swiss Army Knife of event plugins? Event Espresso has everything an event planner could ever need. Customizable event designs mean that the calendar can match your site exactly, or take on a look all of its own. Templates are included for ease of use, but HTML and CSS options are available in case you’re comfortable with those customizations. Multiple ticket and pricing options are available and events can span multiple dates and times. Event Registration helps you know who will be attending. Tickets sales are managed with robust options like multiple ticket selections, easy checkout, and payment and tax collection. Event Espresso even allows promotional codes. Registration and tickets can be tracked and validated via mobile phones. Purchasers can receive confirmation emails after purchase along with directions via Google Maps. There is even an Event Scheduler that helps attendees add the event to their personal calendars, providing an excellent user experience for your customers. Waitlists can be set up for events that sell out. Event Espresso Decaf is the free option with far fewer amenities. Prices for the full product range from $99.95 for a personal license to $249.95 for a business license to $549.95 for developers. There is an application form that can be filled out for requesting a free trial period for testing. If you need it all now or think you will down the line at some point in the future, then Event Espresso is a safe bet that will cover all the bases. The price tag might be the only barrier preventing you from using this plugin. If you need the features and functionality of Event Espresso but would prefer a little lighter price tag, WordPress Event Manager plugin is a great choice. It’s only $75 for a single site or $150 for a 5 site bundle. 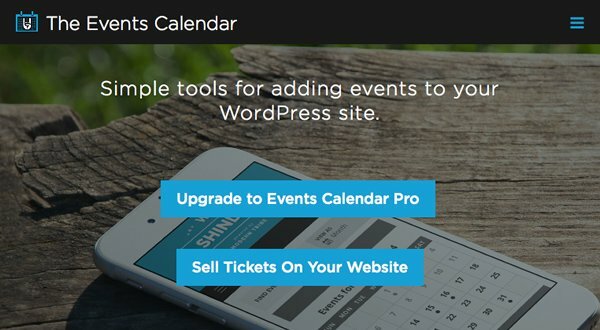 Like Event Espresso, WordPress Event Management offers multiple ticketing options, event registration, and event calendar scheduling options for iCal and Google. There aren’t as many customizable options, but it will more than get the job done. Critics say that the interface is not as easy to use as Event Espresso, although the extra money left in your pocket may make that bearable. 100,000+ active installs show that lots of users aren’t struggling with it. All-In-One Events Calendar has many of the same features as the other premium plugins mentioned here while managing to stand out from the crowd with improved design and aesthetics. This event plugin marries clean visual design with better organization. You can set featured images and category images. There is also the option to color code events by category. In addition to the normal calendar views such as day, week, month, there is also a poster-board view of events, once again adding a stunning visual aspect to the calendar. This event plugin, by Time.ly also includes easy calendar management features such as recurring events, filtering by category or tag, and direct links to filtered events. Attendees will be pleased with easy sharing to personal calendars like iCal, Google, and Outlook, as well as embedded Google Maps. It is $75 for the Pro version of All-In-One, but there is a free version as well. For those needing a free plugin that still offers a lot of convenience in calendar management, Event Organizer is a great choice. Event Organiser makes it easy to create one-time or recurring events. It even handles complex scheduling such as the last Thursday in June, or the 2nd Tuesday of every month. This plugin also has several widgets included such as a Calendar widget, Event list widget, and Event Agenda Widget, so your sidebar can be filled with event info. On the attendee side, the features are few. Event Organizer doesn’t offer ticketing or registrations or personal calendar scheduling, but it does have integrated Google Maps. The opposite of Event Organizer would be Ticket Tailor. This plugin handles all the aspects of ticket sales, but little else. It takes only minutes to set up, handles everything from multiple prices to payment collection and registration. It also integrates with PayPal. What makes Ticket Tailor really stand out is that it includes a barcode scanning entry system, so physical tickets can be scanned at the door. If you really only need the ability to sell tickets online from your website, then Ticket Tailor could be the best choice for you. Even after narrowing the list down from 1000 to eight, it can be tough to decide what is best for your specific event. All of these plugins are in use on tens of thousands of sites. They offer loads of features, and they’ve proven themselves over time. The old adage that you get what you pay for holds true, but you don’t need to pay for features that you won’t use, either. Free versions of plugins are great for personal sites or small sites that don’t need a long list of features. One caution about free plugins would be the limited or lack of support should a problem occur. While free plugins usually offer support, especially if they’re hoping you’ll upgrade at some point, it’s never guaranteed. Free support is also typically slower than paid support. The premium or paid plugins all provide support should there be issues, but if you are hosting a free monthly webinar, ticket sales may not be something to worry about. Also, the more options there are, the more confusing it can be to learn new software, especially for the beginners. Most of the plugins are upgradeable. One of the first things you should do before making a decision is to write out a list of your requirements. Then, start with a plugin that covers the basic features that are needed, and rest assured that you can upgrade from there. What features will you need to promote your event online? Which plugin sounds like the best match for your requirements? If you’re currently using an event plugin on your WordPress site, please share which one along with your experiences in the comments below. Thanks for mentioning Event Espresso! WordPress Events Manager is free. The pro version is as you list, but the paragraph reads as if there is no free version. I am using the free WordPress Events Manager. The best for me. Unfortunately it is difficult to find an event plugin that works well with Divi theme. Events Manager is a great plugin but it has a conflict with Divi, I also couldn’t make The Events Calendar work with Divi. Eventually I ended up using Pods to create custom post types but it makes things so much more complicated. Do you have any experience with at least one of these plugins that works well with Divi? Well, I have 2 sites running DIVI and The Events Calendar. Of course you should be able to handle CSS problems for your self. Most of the WP Users mean to use themes and plugins for free and expect running this all for free and without problems. NO WAY! DIVI is grear and I’m very pleased with the support from the Modern Tribe team. Nce review…. I have been using the Event Organizer for awhile and something that was not mentioned is the great support and customization available from the developer. It also works fine with Divi…. I switched from Modern Tri.be Events Calendar Pro (with various plugins) after 2 years – to Events Made Easy (eme). The plugins Tri.Be had for Events Calendar Pro – didn’t really help me that much for ticketed events. Recurring events weren’t supported. Real basic things.. There was always something that didn’t quite work… or a simple feature that wasn’t put in (like being able to mail yourself a list of people signed up for an event). They miss the simple ease-of-use things that make it hard to plonk down the credit card next time around. Even the simple things like ticket counts of 0 as the default were never fixed. Even with the “Set tickets to 1” prompt I put in each event, people would still submit the ticket form and get a misleading “No Events” message and exit my site… I had to edit the php form each time we upgraded and set the default number of tickets to “1”. Events Made Easy (not reviewed here) in many ways is superior and has more flexibility for my needs – even though it’s free. I gladly paid for Events Calendar Pro for a few years, but their Calendar & features just didn’t meet my needs. I use https://wordpress.org/plugins/opentickets-community-edition/ OpenTickets. May be worth adding here. Joe, I need a combination of Events and Directory Listing that combines Mapping with Calendar filterable by category and by location: similar to http://themeforest.net/item/eventbuilder-wordpress-events-directory-theme/full_screen_preview/11715889 but using your excellent Divi theme? (Not bothered about ticketing or organising tho) Any suggestions? I would also recommend to check out Event Calendar WD plugin. It’s is the most functional and easy to use event calendar available so far.